As the cold months of the year begin to draw in, thoughts start to turn towards winter vacations and skiing holidays. There are dozens of world class ski resorts to be found all around North America, with hundreds of unique runs and skiable areas just waiting to be explored, and a lot of the best skiing in the country can be found in the state of Utah. As the host city of the 2002 Winter Olympics, Salt Lake City has a strong association with winter sports of all kinds. The Utah state capital is surrounded by mountains and boasts some of the best skiing in the country, with several incredible resorts within the surrounding area. Salt Lake City is less than an hour away from some 5-star skiing spots, so let’s take a closer look at the best ski resorts near this city. If luxury and elegance is what you want, Deer Valley is the place to be. This is one of the best ski resorts in all of Utah, featuring houses, condos, and hotels, along with restaurants and stores to provide everything you could possibly need. 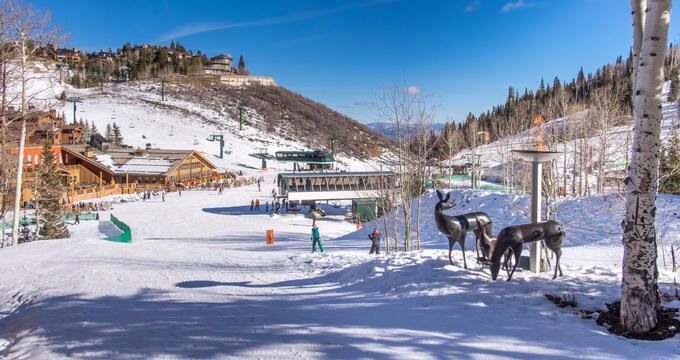 Deer Valley has been consistently rated as one of the very best ski resorts not just in the Salt Lake City area, but in all of North America. The customer service at Deer Valley is second to none, with friendly staff going above and beyond the call of duty to ensure that every guest is fully satisfied with their stay. It's not the biggest resort, but it has the most amenities and a lot of runs for skiers of all abilities. Very popular with Salt Lake City residents and visitors, Brighton offers some world class skiing opportunities for people of all ages and ability levels. Plenty of SLC residents actually visit this location on an annual basis and use it as a good training ground to build up their skills and prepare themselves for some of the trickier resorts in the surrounding area. There are plenty of great beginner and intermediate runs at Brighton Ski Resort, with a lot of certified instructors standing by and ready to offer highly informative, enjoyable lessons and classes. 66 runs can be found at Brighton across 1,050 acres of land. This ski-only resort is located at Little Cottonwood Canyon and sees huge amounts of snow per year. It's only a short drive outside of Salt Lake City and is a big hit with experienced, advanced skiers due to the large number of black diamond runs, but there are plenty of reasons for beginners and intermediate skiers to visit this location as well. Alta offers more than 2,000 skiable areas and over 110 unique runs. There aren't too many additional amenities at this location, which is purely dedicated to skiing, but plenty of good eateries and accommodation can be found short drives away. This is the largest ski resort in all of Utah and a major attraction in the Salt Lake City area, being just a short, 40-minute drive outside of the city. Established way back in 1963, Park City Mountain features an astonishing 7,300 acres of skiable land. More than 300 individual ski runs can be found at Park City Mountain, with over 40 different ski lifts of all kinds for easy access and transport around the resort. Enormous terrain parks are also located on site, along with a half-pipe area. The resort also has strong links with the local town of Park City, with a lift running right down to Main Street. Located at Mount Timpanogos not far from the city of Provo, Sundance Mountain Resort has been a super skiing site for several decades, with skiing starting in the area way back in the 1940s. Unlike some of the flashier ski resorts around Salt Lake City, Sundance is relatively small, with just 450 acres of land, but this means that the crowds are also smaller and the resort has a more intimate, private atmosphere. A good range of eateries and accommodations can be found nearby, making Sundance one of the most fully-featured small ski resorts in Utah.